Today, Chevy Vegas are practically all gone except for a few – like this one – running with V8s on drag strips or a handful of highly prized limited-edition, twin-cam Cosworth models. 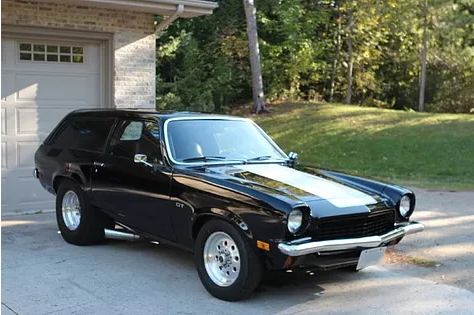 This Vega began as a business delivery version without rear side windows – just steel panels. This version was very basic, and could be ordered with only the driver seat – the passenger seat was an option. In the early 1970s there was growing pressure from import ”economy” cars selling into North America. The response was to rush some small cars into production to hold on to customers. The GM Vega, Ford Pinto, and AMC Gremlin were produced to battle the less expensive imports – most notably Volkswagen, Toyota, and Datsun. Even though the market was shifting, there was still strong loyalty for North American cars and for a few years the customers hung in there. Pushed to be competitive, design Engineers needed a light car for economy and the Vega’s thin metal bodywork makes it quite light. 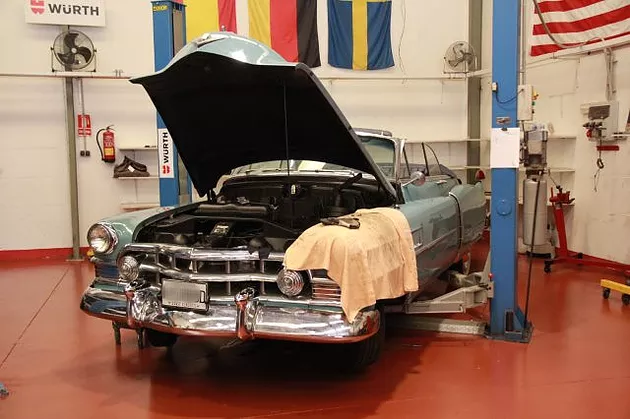 However, the thin steel and poor undercoating made the Vegas rust out prematurely – part of the reason why there are very few remaining as regular drivers. The Vega sold in huge numbers. During its first model year, 1971, Chevrolet pushed 277,700 of them out through its dealerships. During 1972 they sold another 394,592 units, then 395,792 in 1973 and 452,886 for 1974. 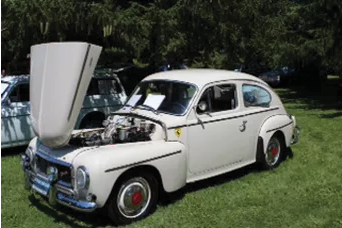 There were some mechanical design issues with the stock 4 cylinder Vega engine also but eventually the light weight and good handling characteristics became attractive as a good platform in the hands of drag race car builders. Norm Ribey is a General Motors car guy. He has a number of GMs from the Vega to a Corvette and some in between. GM cars are his passion. He located this Vega in 2002 with 6400 miles behind it. 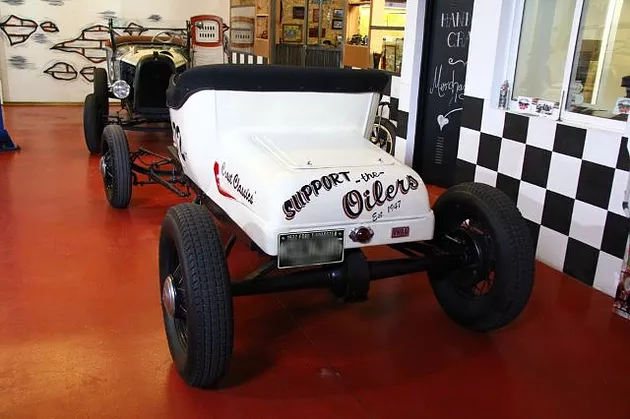 The car had been constructed for drag racing by Robert Nagey Racing in Welland, Ontario and the engine was built by Jim Oddy in Buffalo, New York. The engine is a 400 cu. In. 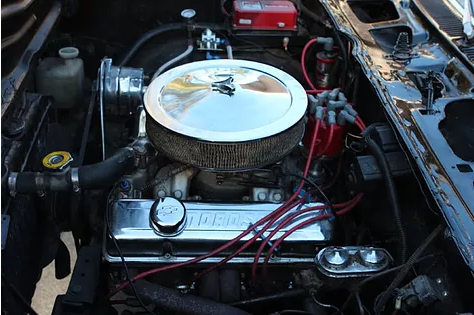 small block Chevy, and the build was originally equipped with a supercharger. It currently has about 600 horsepower. 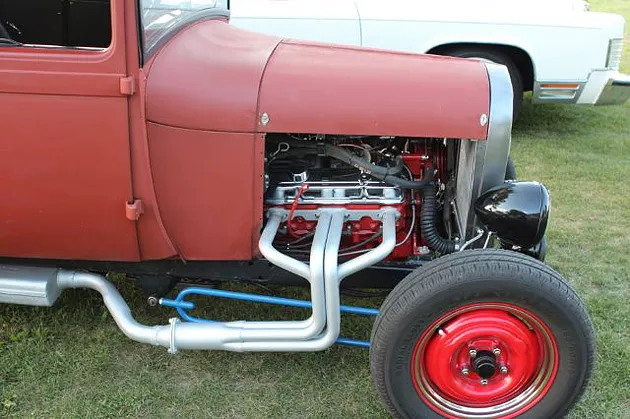 Now Norm runs a 4 barrel Holley carburetor (and no blower) and uses the Dana 60 rear end which can easily handle 600 horsepower, and is commonly accepted as the strongest passenger car axle you can find. Norm regularly runs the quarter mile in 11.7 seconds and reaches 110 mph. Norm keeps a close eye on engine temperatures on hot days. It runs best at coolant temperatures between 170 and 180 Degrees (F) and if he has to wait in line for the race start, the temperature can begin to creep up – due to tight engine tolerances. If it gets to around 200 Degrees, his times drop off. With temperatures over that, he begins to worry. Here we see the “sprung” wheelie bars. The main goal of wheelie bars is to control how high the nose of the car comes off the ground when the driver hits the accelerator. 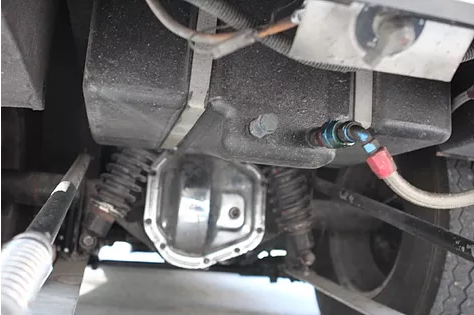 With all that power and rear wheel drive, if the nose gets too high, the driver not only loses the ability to steer the car, but eventually the back bumper can drag the ground followed by the car slamming back to earth and likely breaking parts. Even worse, drag cars can flip over backwards. Wheelie bars keep that from happening, but they also do more than that. They act as a lever when they hit the ground and lift the rear tires slightly. This allows the rear tires to slip in a controlled manner without fully losing traction and going up in smoke. 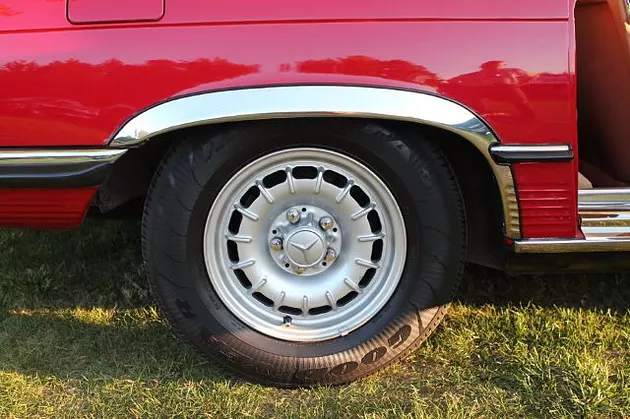 If you see a slow-motion video of the rear tires, you can watch the “slingshot” effect of the back tires – which hold about 12 lbs pressure; you can see how the cars squat down in the rear when the green light goes on. Norm added the shift warning light next to the tachometer to make doubly sure he shifts gears at the right time. Things happen pretty fast in a quarter mile run and mistakes can be costly. 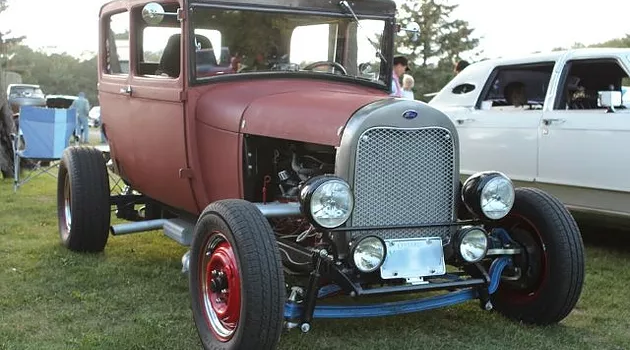 There is no question that the Ford Model A is the definition of the cars known as hot rods. There are likely more variants of this car than any other in automotive history. In fact it is really the definition of personal transportation and thousands have been built. I even saw some in Spain and expect there are examples around the world. Usually built by individuals, you can even commission a designer-built version that will win prizes at car shows or custom shows. The Ford Model A was the second huge success for the Ford Motor Company after the famous Model T which had been produced for 18 years. The Model A was designated a 1928 model and came in four standard colours. By Early February 1929, one million units of the Model A had been sold and by July, two million as amazing as that sounds. Body styles ranged from the Tudor at $500 to the dual cowl Town car at $1200. In March 1930, three million had been sold and by then there were nine body styles available. Model A production ended in March 1932 after 4,858,644 units had been sold in all body styles. Next Came the Model B which had an updated 4 cylinder engine, and the Model 18 which introduced the new Ford Flathead (side valve) V8 engine. 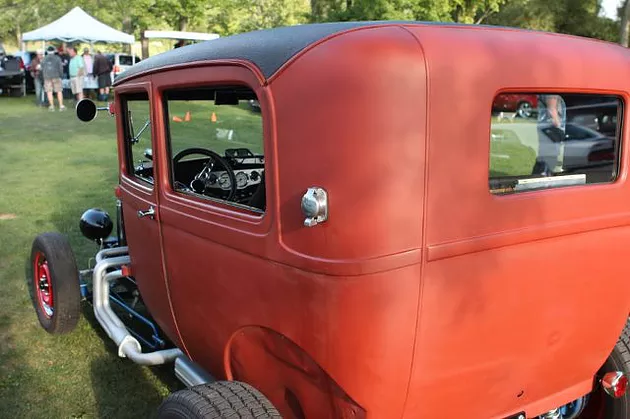 Hot rods are almost as old as the automobile. The timeline for hot rods and custom cars starts before World War II. Teens itching to tinker with cars and go fast were racing cheap Ford Model Ts on Southern California’s dry lakes and street racing in Los Angeles even in the 1920s. The vast majority of the cars being run were four-cylinder Ford Model Ts or their successor, the four-cylinder Model A. The early hot-rodder movement gained momentum when World War 2 veterans, still young and often trained technically in the army, needed to make a “go fast” car they could race each other with. They could pick up the basic old cars for little money (often from scrap yards). 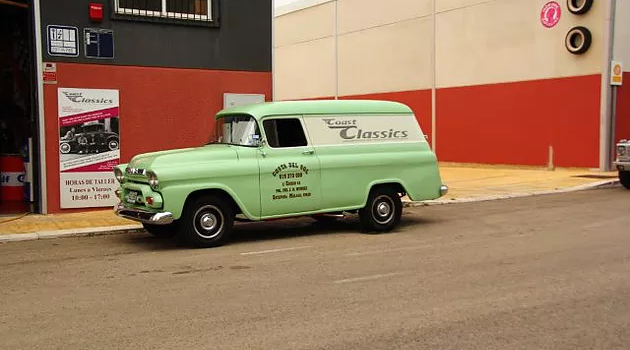 The flat head Ford or Mercury V8 was usually the base engine they modified with performance heads and extra carburetors and cut weight by eliminating fenders and chopping the roof. Later, bigger overhead valve engines like the Cadillac and Oldsmobile or Chrysler Hemi were often substituted – anything to go faster than the others!! Some very sophisticated engineering developments grew out of these cars and street racing gradually developed into NASCAR and drag strips. A whole industry developed to supply performance equipment demanded by the hot rod community. This ’29 Model A Tudor was built in the tradition of the original hot-rodder’s. Rick Guy and his best buddy started his personal version of a hot rod when he was 15 and still in high school and he had a pretty good idea of what he wanted. However the project stalled out and the first attempt is resting in his buddy’s barn to this day. 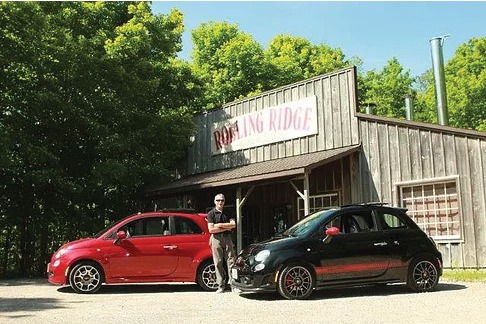 Later, only a few years ago, Rick’s son, now an adult himself, figured it was time for his dad to get back at it and build his dream car – if not now than never. He sensed his dad’s hesitation but went ahead and found the right body and some key parts in the Michigan Auto Trader magazine. He dragged Rick over to look at it and convinced him to make the offer – then they arranged to trailer it home to Canada. With the old hulk on the trailer, Rick says the Customs officials at the border looked closer at the tow vehicle than the old Ford out behind. Rick thought about building his car for so long, he had a pretty good idea of what he wanted. Dad and son moved it into Rick’s shop at home and he began to redo all the welds. The original gas tank was in the cowl in front of the windshield and it was full of walnuts. That section was removed and a new tank fabricated for the location in the rear. Rick fabricated a new firewall. The engine is the 350 small block from Chevy and he chose the 4 barrel carburetor on the Edelbrock Performance intake manifold. The headers are from Speedway and he made the balance of the exhaust system himself. His transmission is the GM 700R4 – a four speed automatic with a 30 % overdrive in 4th gear. His rear end of choice is the 7.5 inch Ford. Almost all hot rods have different wheels front and rear to lower the front end – referred to as “rake”. This lowers the front end and reduces weight while the bigger rear tires increase traction on hard acceleration. Rick uses 15”X4” Volvo front rims and 15”X 6.5 Ford rims on the rear. Rick also knows his old Volvos and knows that certain Ford and Volvo rims use the same bolt patterns. The interior design is Ricks also. 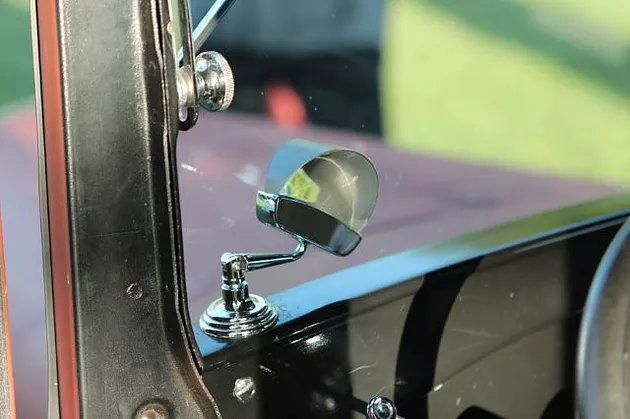 One neat old time feature he retained is the dash mounted convex mirror that lets the driver monitor overhead traffic lights without having to bend over to look up through the shortened vertical windshield with the visor. Every time I see Rick with his ’29, he has a big grin – finally he has his hot rod – made it himself – and I wish I had his talent. Now he is building a matching trailer to be to ready haul his stuff while out summer cruising. 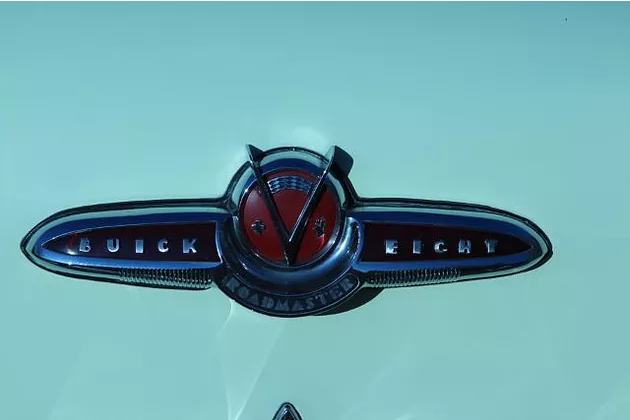 Created as a “Dream Car” to mark Buick’s 50th anniversary, the Roadmaster Skylark was actually unveiled in 1952 by General Motors to promote its design leadership. The Skylark went into actual production in 1953 and its run of 1,690 units proved very successful. 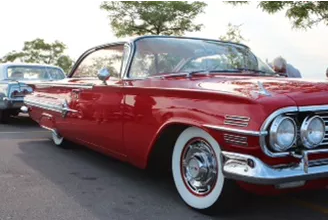 This was an amazing sales feat considering the car’s 1953 list price of slightly more than $5,000 USD that was over 50% more than the well-equipped $3,200 USD Roadmaster convertible on which it was based. In spite of being the styling sensation, many stayed in dealer showrooms and eventually had to be sold at discount. Production ran for two years. 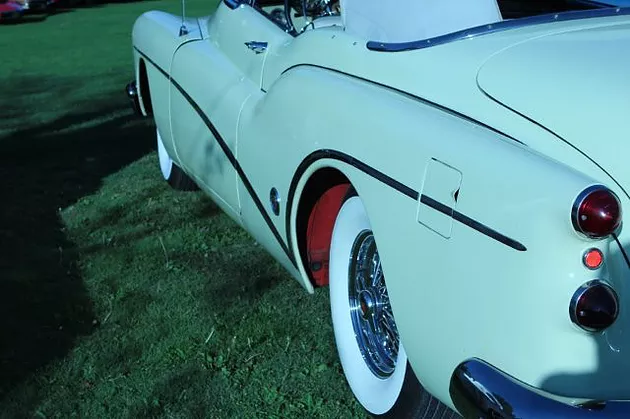 Compared to the two-door Roadmaster convertible, the 1953 Skylark had identical dimensions (except height), very similar appearance, the same drive train, and all its standard equipment, plus its few additional options, including power windows, power brakes, full carpeting, and a “Selectronic” AM radio. Air conditioning was thought unnecessary in convertibles. The Skylark set the pace for future mass-produced Buicks, with its wraparound windshield, full wheel openings and a two-way chromed “sweepspear” that began at the front wheels and dipped sharply ahead of the rear ones before “jumping” over them and ending near twin “bullet” taillights on each rear fender. The Skylark engine was Buick’s new 322 cu. In. (5.3 L) Fireball “nailhead” overhead valve V8 that replaced the longstanding straight 8, and a 12 volt electrical system – both division firsts. The engine was rated for 188 hp. Also new, were full-cut-out wheel openings, a styling feature that carried on to the main 1954 Buick line. The top speed was estimated at about 103 miles per hour (160 kmp/h) and the acceleration was 0-60 (100km) at about 13.4 seconds. 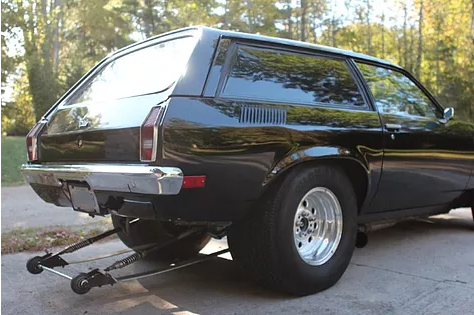 This was actually not bad considering the car weighed over 4300 lbs and had the Dynaflow two speed automatic transmission – not considered as punchy as the Hydra-Matic used in Oldsmobile and Cadillac. However the 4 barrel Rochester carburetor was a great help. 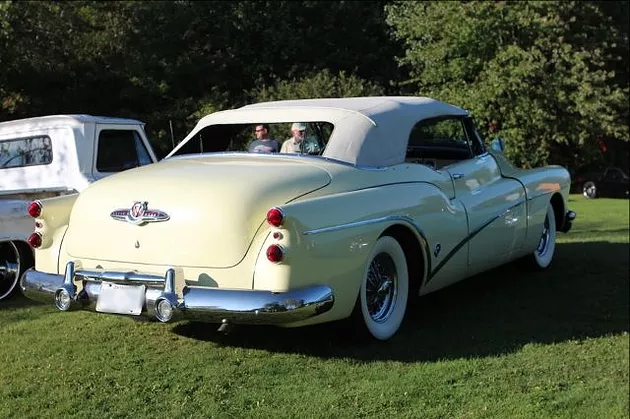 The 1953 Skylark was almost totally handmade other than the hood, trunk lid and a portion of the convertible tub which were shared with the Roadmaster and Super convertibles. All Skylark tubs were finished with various amounts of lead filler. 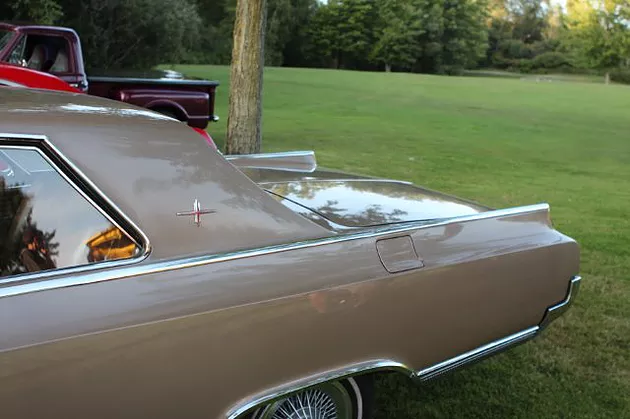 The inner doors were made by cutting the 2-door Roadmaster’s in two then welding the pieces back together at an angle to produce the rakish door dip. 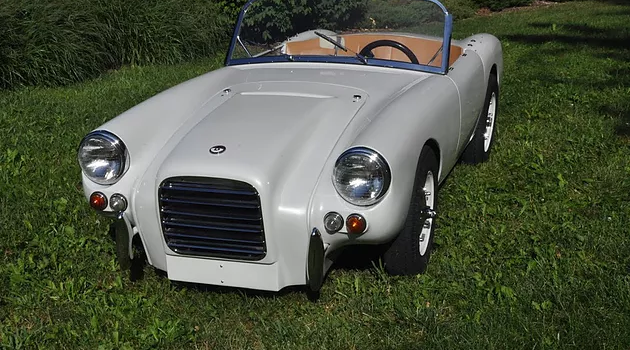 An overall more streamlined look was reinforced by cutting the windshield almost 3 inches (7.6 cm) shorter and lowering the side windows and convertible top frame proportionately. Seat frames and steering column were also dropped to provide proper headroom and driving position. 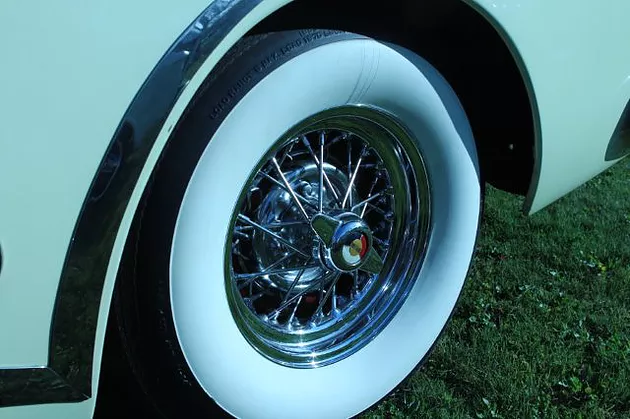 Authentic wire wheels were produced by Kelsey-Hayes, totally chromed except for the plated and painted “Skylark” center emblem. 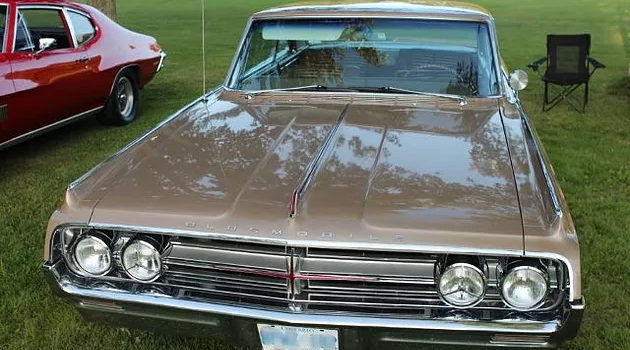 This Buick Skylark was seen in Watford Ontario in the 1970s but today’s owner wasn’t able to buy it for several years. When he finally made the deal, other than no functioning brakes, it otherwise was very solid overall. He began his very first total restoration – or as he says “his first serious restoration”. This included the interior. 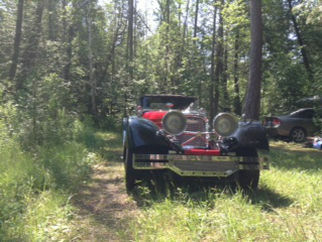 He admits the car won’t take top prize at Concours events but it is a special car to own. He drives it to events as far away as Cincinnati, Columbus Ohio and Maryland and the main goal is to keep it mechanically reliable and enjoy the experiences it provides. 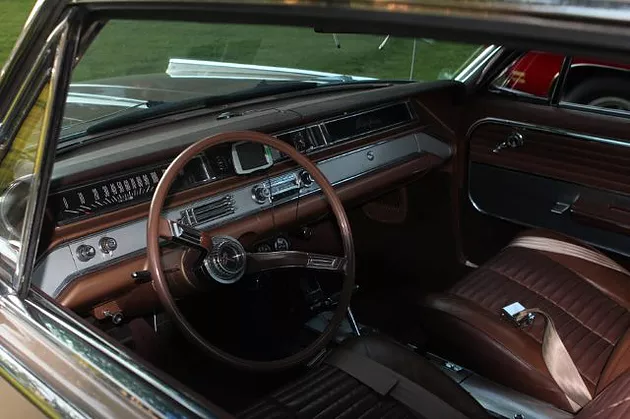 Skylark buyers naturally expected lots of luxury–and they got it: There were soft-tanned two-tone cowhide seats, and the owner’s name was engraved on a gold-coloured emblem plate on the steering wheel hub. 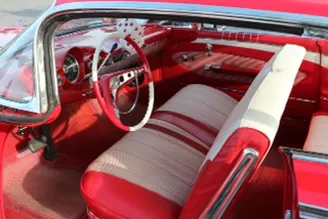 Every conceivable accessory at the time was standard, including tinted glass, whitewall tires and power seats, windows, steering, brakes and top. It would be difficult to find a Skylark that isn’t in really good condition because owners know exactly what they have. 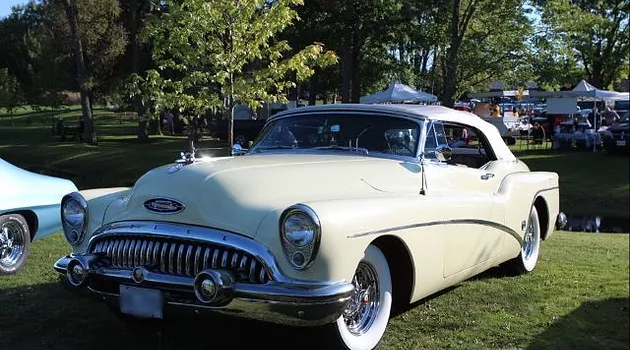 Singer Neil Young’s 1953 Buick code 76X Roadmaster Skylark convertible with a steering wheel hub that says, “Customized for Neil Young,” recently sold for $400,000 at auction. The 1964 model appeared very similar to the 1963. Curb weight was down, but overall length was up to 215.3 inches. Sales dropped this year to 13,753 coupes (down 36%) and 2,410 convertibles (down 45%). The Starfire shared its basic body shell with the new and lower-priced Jetstar I hardtop coupe and competed directly against the Pontiac Grand Prix. The Starfire’s engine had 345 horse power from a 394 cu in “Ultra High Compression” Rocket V8, and had many standard features including Hydra-Matic transmission, power steering and brakes. Front seat belts were now standard. When Andrew Ahlborn was looking for a ’72 Olds, he saw this 1964 Starfire in a service station lot on highway 24 where the owner had placed it hoping to find a new home for what turns out now to be a relatively rare high performance luxury car – often called an “Executive’s Hot-rod” direct from the Oldsmobile factory. Although it was a standard feature of the Starfire, not all examples feature the custom-looking tri-bar headlamp cover found on the high beams of Andrew’s car. 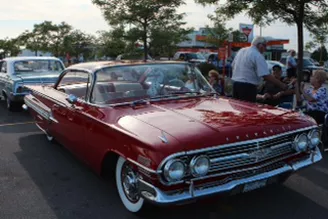 The covers appeared on the first Starfires built before and shortly after Oldsmobile’s 1964 model-year introduction in October, 1963, but this feature was dropped before the year was out. All Starfires were supposed to come with them, but the public was getting pulled over for having them. Owners told dealers to pull them off. Oldsmobile stopped making them, so if you wrecked your car, they were impossible to replace. 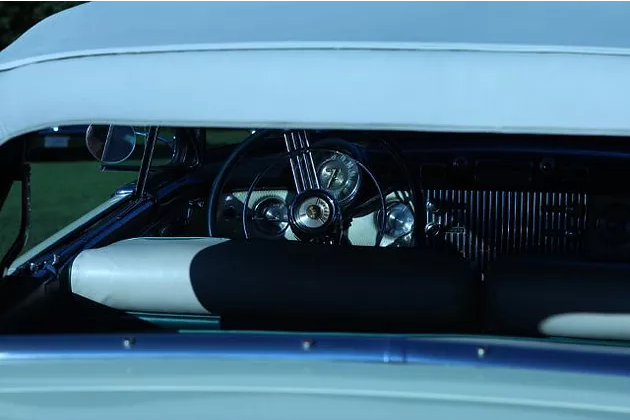 Oldsmobile referred to these tri-bar headlamp covers as “custom sport headlights” and they are expensive and extremely difficult to locate. 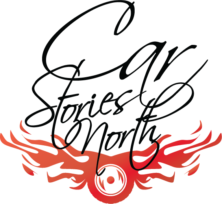 The Starfire name was first used by Oldsmobile on a one-of-a-kind “dream car” shown at the 1953 Motorama auto show. In keeping with aircraft images becoming popular to help sell cars, it was named after the Lockheed F-94 Starfire jet fighter. 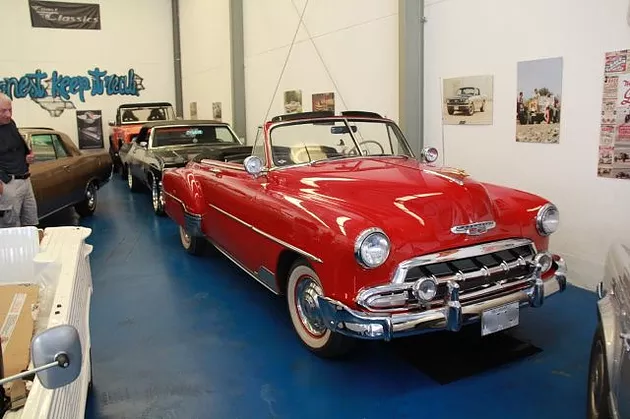 This original Starfire was a 5-passenger convertible that had a fiberglass body, a 200 hp Rocket V8 engine, and a wraparound windshield like that used on the top-of-the-line and limited-production 1953 Fiesta 98 convertible. Rear-wheel Drive (RWD), automatic 3-speed gearbox. Petrol (gasoline) engine with displacement 394.2 cu. in, advertised power 345 horse power, torque 440 lb-ft. Characteristic dimensions: outside length: 215.3 in, width 78 in, wheelbase:123 in. Reference weights: shipping weight 4153 lbs base curb weigh 4343 lbs. How fast is this car ? top speed: 200 km/h (124 mph) (theoretical). Accelerations: 0- 60 mph 8.6 sec. ; 0- 100 km/h 9.1 sec; 1/4 mile drag time 16.6 sec. Fuel consumption and mileage: average estimated: 11.4 mpg (imp.) / 9.5 mpg (U.S.). 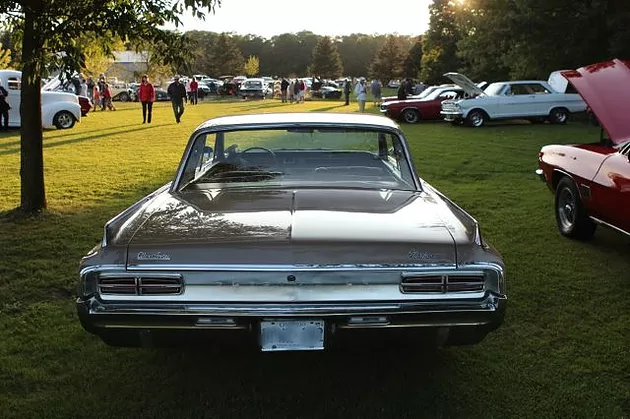 This was – and is – a very special car and was almost the culmination of the performance Oldsmobile brand – by now one of the oldest brands in automotive history. For some odd reason Oldsmobile was cancelled as a brand in 2004 – today referred to as just one example of General Motors mismanagement – odd because over the 100 or so years of the name – even when Olds was forced to compete internally with other GM models, it remained a proud and sought after name (except of course when it was lumped in with other amalgamations during the 1970’s automobile industry troubles). The Oldsmobile division’s last completed production car was an Alero GLS 4-door sedan, which was signed by all of the Olds assembly line workers. It was on display at the R.E. Olds Transportation Museum located in Lansing, Michigan, until GM’s bankruptcy when they retook possession of the car. It is now located at the GM Heritage Center in Sterling Heights, Michigan. 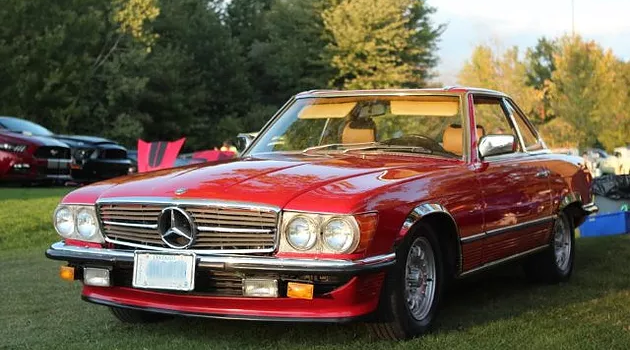 In 1980, Mercedes-Benz revamped its SL lineup of sporting luxury convertible/hard-tops with the introduction of the 380SL. The 380 was a further development of the R107 chassis, which was first used in 1972 by the 350SL, and then later by the 450SL. 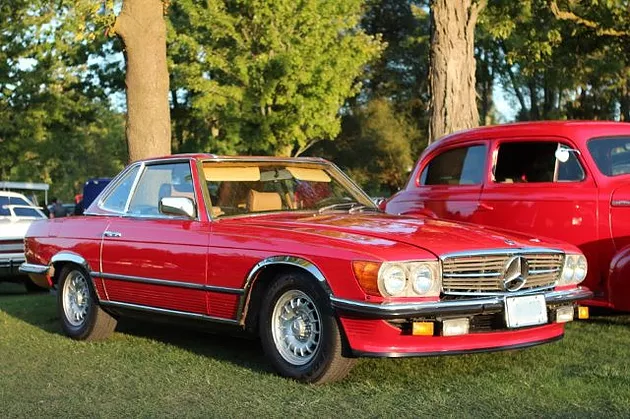 Like its forebears the 380SL was a heady mix of V-8 power, refined luxury, and sporty underpinnings, and it was as a very popular model during its run in the U.S. 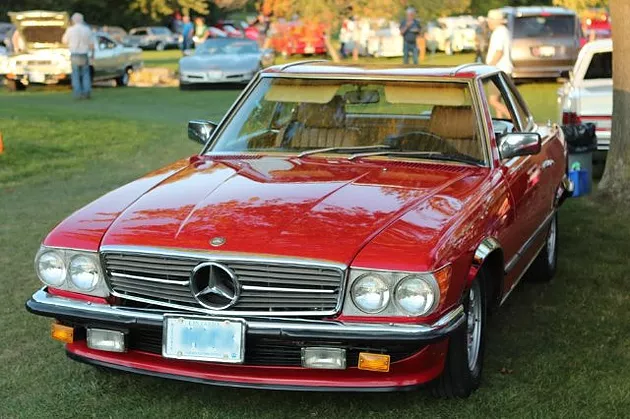 The 380SL, is named for its 3.8-liter V-8, a smaller engine than the 450SL and consequently 120 pounds lighter. 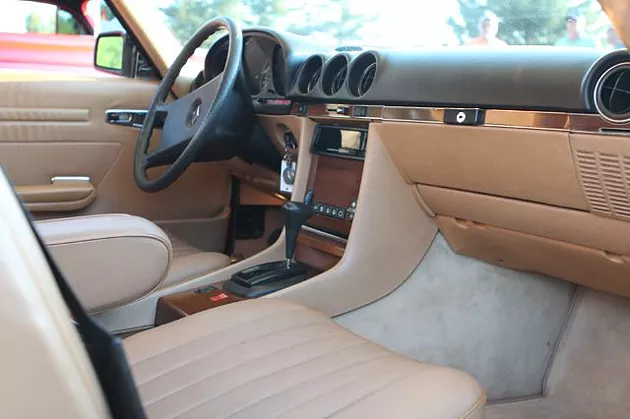 The engine was designed with emissions controls in mind while the 450SL’s mill was not, which meant that the two engines were relatively equal in terms of power (155 hp in the 380SL vs. 160 hp in the 450SL) despite the difference in their displacements. Performance was similar for the two cars, as was fuel economy. The 380 SL was close to the quickest Mercedes model in 1982 with the top speed reported as 215 km/h (134 mph) – 1 mph slower than the fastest! Still fast enough! 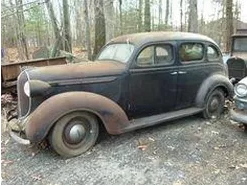 Dave Lloyd is the owner of this car – which he found in Pigeon Ford Tennessee at a car show among 6 miles of cars. He wasn’t there to buy a car but as he says – this is just a timeless beautiful car which he had to have. It will not see winter or rain while Dave has it. The condition is as new. He has only had minor cosmetic work done to it. Dave is actually well known as a motorcycle guy – he has ridden the hair-raising Isle of Mann race four times and spent some years on the Grand Prix circuit in Europe. Believe it or not he even made an attempt at the Bonneville Salt Flats in the Arrow Streamliner. This is, as he says, a beautiful iconic car – a model most of us have looked at longingly over the years. Dave says this car was imported to the US in 1982 at a price of $45,000 which is well over $100,000 in today’s money. However, due to loss of his normal storage arrangements he will reluctantly have this car for sale soon. It is important to note: Dave drives this car sedately and with the respect it deserves! 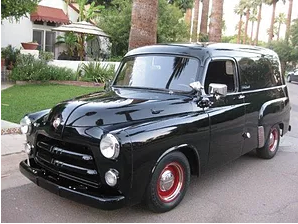 The Berkeley automobile was a joint effort between designer Lawrence Bond and the Berkeley Coachworks factory owned by Charles Panter, which at the time was one of the largest manufacturers of travel trailers (caravans) in Europe. It was an ideal project for Berkeley, which had developed considerable skills in the use of glass reinforced plastic (GRP), and were looking for something to fill the gaps in the very seasonal caravan market. What they both wanted to achieve was “something good enough to win World 750cc races… but cheap, safe, easily repairable and pretty. Well, pretty is a good word for the design. Pretty and small – length is just fractions over 10 feet! The design is so good that you can’t tell how small it is until you park beside something else. For perspective, the new Fiat 500 looks large beside the Berkeley. The early cars were an immediate success in the UK market, and there were several models over the four years of car production. Export markets, like the United States, were developed and the cars earned a reputation for fun sports motoring on a budget. 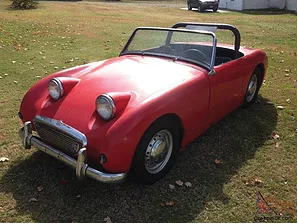 The newly introduced Mini and Austin-Healey Sprite in the late fifties, pushed the company to start to develop a more conventional model. Just about then though, towards the end of 1960 the travel trailer market collapsed, and Berkeley’s assets – including its cars – were liquidated in 1961. The source of funds to carry on had dried up. All told, about 4100 cars had been produced. The B95 and B105 models were launched in 1959 and with more power from the 50 bhp Constellation motor, the B105 could now exceed the magic 100 mph (160 km/h). 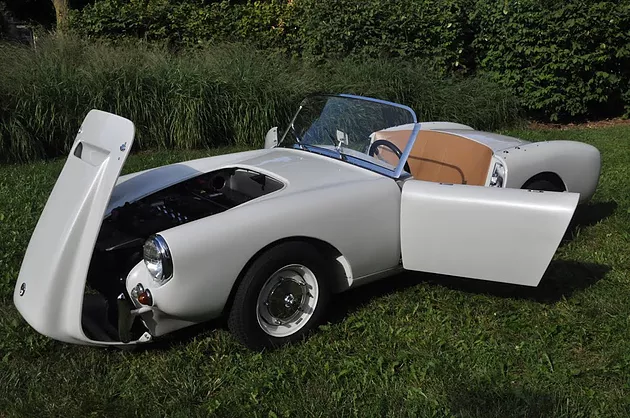 The prototype car was modified to add bracing to withstand the extra power and weight of a four-stroke engine, and a taller hood with large grille to accommodate the engine. The new front- end design became quite distinctive and aggressively attractive. However, essentially, the car was built with 3 tubs bolted together at the bulkheads. Bob wasn’t overly concerned about the structure until he was measuring the car for a new top and tonneu and when sitting in the car the measurements changed – meaning there was considerable flexing with the tub-no-frame design. That wasn’t comforting to Bob who has built and raced a number of Formula 4 cars and modified a few other types – including this little Berkeley that would now easily accelerate to over 160 km/hr. With that in mind, it is easy to see why Bob added support to stiffen up the basic structure. The 3 fibreglass tubs bolted together wasn’t confidence inspiring! Now the car is considerably stiffer with the tubular frame and the stronger wheels which Bob also fabricated. When comparing the 1956 version with its 15 hp to Bob’s car, below the surface, there is very little “stock” Berkeley remaining. His Kawasaki 4 will crank out 100 hp and rev up to over 10,600 rpm. His conversion includes a six speed sequential transmission with electric reverse. Back when these cars came out, Bob was intrigued but in those days the $1800 price was just out of reach. That would be roughly equivalent to $14,000 today and just starting out Bob didn’t yet have that much cash to spend on a car. 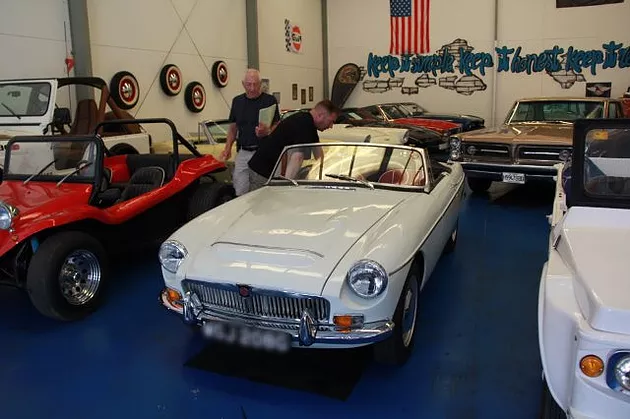 So he had to wait a bit and knew about this one which had been in boxes for 20 years waiting for restoration – just the sort of challenge typical for Bob – he could now improve the original design shortcomings and end up with something to enjoy at speed! This car weighs about 800 lbs – driver extra– so the power to weight ratio allows it to be quite quick! Berkeleys were always impressive as racers even with the small engines and it handles the corners like it is on rails! He winces a bit about the Diamond White paint job which cost him 3 times the cars’ 1960 price tag. The new windshield took some time to arrive from England but it was not just sitting on-the-shelf waiting for Bob to order it! Even though the original pattern was still available at Pilkington Glass, it took a while for it to be made and shipped – prepaid of course. Being such a “one-off” item, it was a nervous many months spent waiting and hoping it would arrive in one piece! But it handled the trip from England and was a perfect fit. The new top and windows recently added are a great addition and custom made, they follow the original design which gives good visibility while driving. In fact this car is so small – the top up position makes the car more visible to other drivers as well! Harvey Eckmier was trying to find a 1959 Chevrolet back in 1991. In London, Ontario there was an antique car dealer on Warncliffe Road and this car was for sale there. It had been imported from Nashville. Even though it wasn’t Harvey’s preferred colour, it had the required low mileage and great condition as most cars from “No-Salt-States” tend to be. 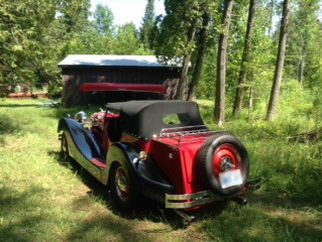 Harvey bought it and in March 1993 it was time to get it into the body shop so the restoration could begin. 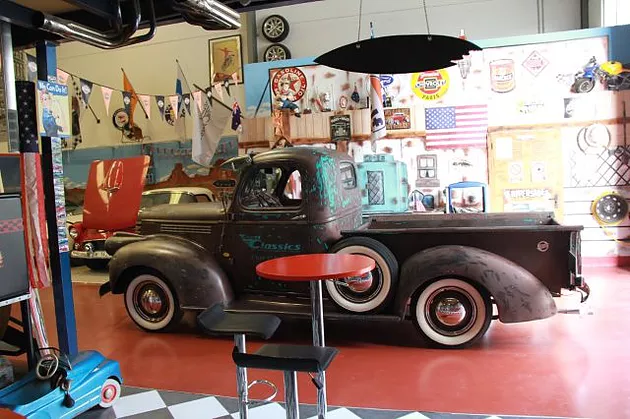 Harvey’s brother-in-law is Ron Box – a well known high end restoration master craftsman who has restored and customized countless other outstanding cars. Naturally, Ron was in charge of this project. Harvey points out that this car was restored 25 years ago (and counting) -but it looks like it was just finished yesterday!! 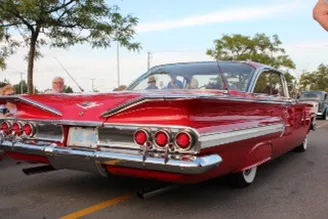 Since the restoration this Impala Sports Coupe has been driven over 60,000 miles (100,000 kilometers) and currently sits at 107,000 miles (172,000 kilometers)! It has won over 160 awards including “Best Interior” over at the annual car show in Michigan at the Henry Ford Museum. 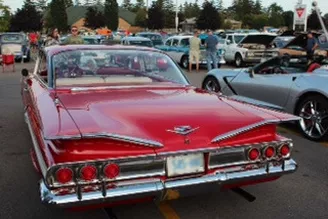 The rules said he had to split the title with another car otherwise this amazing Impala would have won “Best Exterior” as well! States and truly enjoys the Impala’s terrific highway ride. 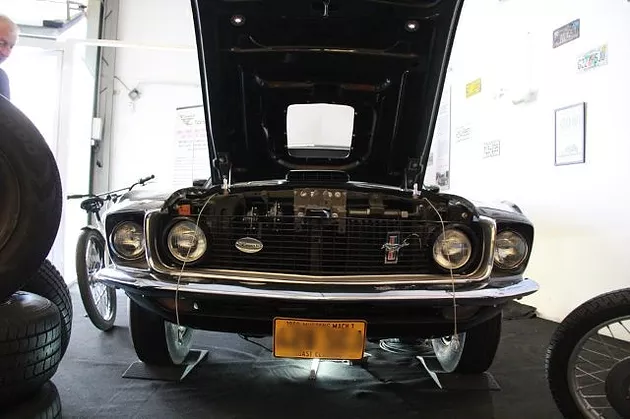 With the stock 283 cubic inch engine and the two barrel carburetor, the fuel economy is pretty good and the power is of course just the way the car came from the factory. The view from the rear corner really highlights the car’s lines which gives a sense of the sculptured look from that era – the jet plane stainless steel image on the fender trim, the flattened fins as the finned era was moving on and the famous “bubble-top” roof line with the huge expanse of glass! This car brings back memories of days when 6 full size adults with their luggage could fit into one car!! 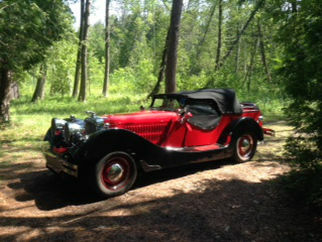 Jack Pearce continues to modify his Replica of the 1937 Jaguar SS 100. Since his initial interview by Car Stories North, he has added the spare tire mount, relocated the gas tank filler and doubled up on the radiator in front for additional engine cooling capacity. Under-hood-heat for the V8 Chevy engine needed to be reduced to the 180-190 degree range. The custom stainless steel bumpers -front and rear- are also new and the designs were a co-operative effort between Jack, a fabricator and some technology students from Georgian College in Barrie, Canada. The rear bumper helps support the spare tire as well. 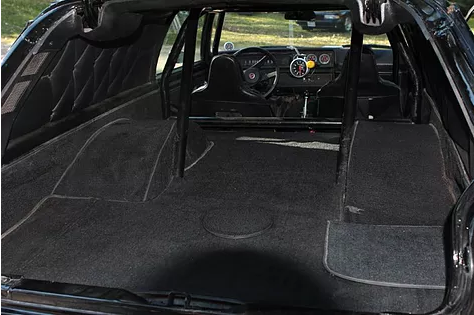 The rear tire mount system took some thought – but the solution he designed opened up the sizable trunk for travel storage and it balances the design of the whole car. The Lexan windshield wings reduce the cockpit turbulence. The wind net he “Velcro’s” to the roll bar helps keep his wife’s sun hat on at highway speeds. Jack keeps telling me this car is not intended to be an accurate reproduction – he knows historical Jaguar purists will object to his version. His goal was- and is, to have an enjoyable summer car that he can take anywhere in confidence. 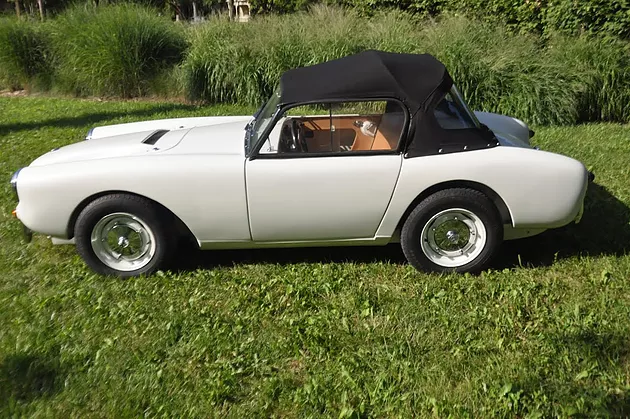 I really like the period style of the convertible top and side curtains that do a great job keeping them dry and warm in rain or cooler weather. Interestingly, his extra radiator is separate from the main rad. He removed the heater and instead connected the supplementary radiator to the heater hoses. He usually drives the car in summer only and the heater is not required. This seems like a simple solution for extra cooling – something I might consider for my old car too! A number of hot days in long traffic I have opened up the heater to circulate more coolant to the system and bring engine temperature down. Jack is a senior international level competitive Laser sailor. He was chosen as one of 38 sailors to compete in the 2017 World Senior Laser Championship in Croatia. He installed a pretty hefty trailer hitch on the rear to haul his Laser sailboat on its trailer so he can drive his Replica Jaguar to sailing competitions. After teaching College math for 51 years, Jack now spends his days driving his car, international sailing and another of his hobbies – adding LED lighting to model cars, ships, trucks, service vehicles and railroad rolling stock – much of which he exports to other hobbyists. This car along with his other hobbies keep Jack smiling and on the lookout for another challenge!